I don't have children, but this is my kid, as it's about 9 months since i started thinking about it and then doing it. 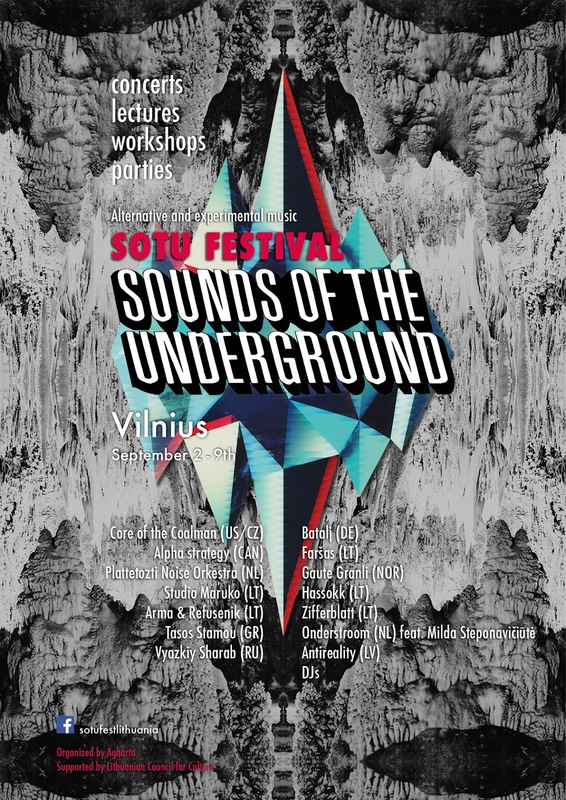 Yes it's the first Lithuanian edition of SOTU festival (sounds of the undergound), which is held originaly in Amsterdam since 2012. It's a new step in my activity cause I never had this kind of international collaboration by doing mutual event. And am really glad about it and of course a little nervous. Anyway, it's coming up. On this tuesday! The program which is held in 4 towns (Vilnius, Kaunas, UKmergė, Jonava) contains 20 artists and bands from 9 countries, also 6 lecturers and DJs. I know that most of the artists are not so known, and that is the idea of this event: to present less known but unique artists. If you need names, here they are, but even if you don't know, come and be surprised by their music and creativity! Batalj (De), Faršas (Lt), Gaute Granli (Nor), Hassokk (Lt), Kira Sheppard (Can) Onderstroom (NL) feat. Milda Steponavičiūtė, Antireality (LV). Core of the Coalman (US/Cz), Alpha strategy (Can), Plattetozti Noise Orkestra (NL), Studio Maruko (Lt), Arma & Refusenik (Lt), Zifferblatt (Lt), Tasos Stamou (Gr), Vyazkiy Sharab (Ru), Easterndaze (Cz), Mylo Cywitz (NL), Schelvis en de Pekels (NL), Raimundas Eimontas (Lt), Gailė Griciūtė (Lt), Patris (Lt), Djs QQ and Grįžulo ratai (Lt). May the Spirit of the Underground be with You!